Big Chuck is a woodchuck with a taste for pie. He daydreams about warm, flaky pastries and their fruity filling. When he spots a freshly baked blueberry pie cooling on the windowsill, he must have it. Chuck can't reach high enough, so he recruits his friends to help. Maybe Raccoon or Rabbit can get the pie? It takes some impressive and athletic teamwork for Chuck and his friends to reach the ledge, but their reward is so sweet! In a totally classic way, Schories' Chuck books are another fantastic tool for beginning readers. The art and text are not revolutionary, but at the same time, that's what makes it so great. Each page has around six simple words on it and is fully illustrated in soft watercolors—your standard early reader, yes? But there's just enough detail in the illustrations and just enough interest in the plot that it's more exciting and more fun for readers. In Pie for Chuck, though the cover basically gives the story away, the illustrations of adorable animals (complete with emotions/expressions to expand on the text) trying their best to reach a rather delicious looking pie keeps the readers attention. I also love that the end pages are part of the story, too—plenty for kids to look at. 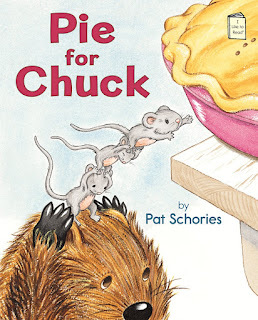 Her first book, Pants for Chuck is even more hilarious (because, hello, how often have you seen a pair of adorable little pants on a woodchuck?). Honestly, I'd recommend them both as a tool for the earliest of early readers. They're fun and build some confidence.